A very cold morning to start with temperatures as of 7 AM in the teens for most locations, with lower 20's in and around the city. The city is currently at 21 but dipped to 20 earlier to set a record low for cold. We have a pretty progressive pattern across North America. The deep trough associated with the arctic blast that came in Saturday night has already moved past the region and is in the Canadian Maritimes. Winds have died down and will be much less of a factor today. High Pressure has built in over the region. The High will move offshore during the day and that will allow winds to shift to the southwest, bringing a return flow and warmer air aloft. Sunny skies to start, this will allow some high clouds to develop through the day. But there will still be plenty of sun. The cold is pretty deep at the surface and while warming will occur aloft, with light winds at the surface today, it will take some time for the cold to retreat. 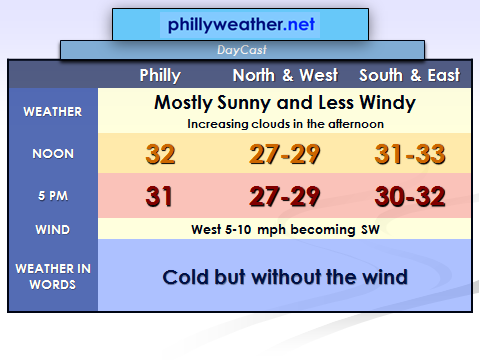 Temperatures will only be a few degrees warmer than yesterday, but will it will feel much better without the wind. Highs will reach the upper 20's for northern areas, well north and west of the city. They will warm to the lower 30's in the city and mid 30's as you go south into Southern NJ and Delaware. Enjoy the dry weather today as the next two days will be quite wet with lots of rain. It will not be the best of travel this year before the Thanksgiving Holiday.